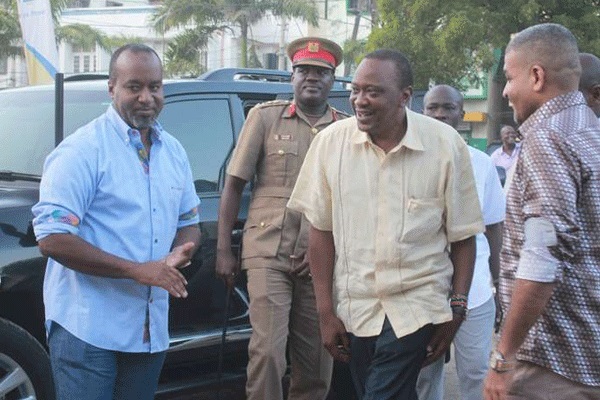 Tuesday July 31, 2018 - President Uhuru Kenyatta has offered to help Mombasa Governor Ali Hassan Joho to manage the County. This follows yesterday’s secret meeting between Uhuru and Joho which broke the fortunes of Mombasa. For starters, Uhuru revoked titles for all the grabbed land in Mombasa and ordered that land allocated to private developers next to the Kibarani dumpsite be repossessed. The President also agreed to a request by Joho to work together on the coastal city’s regeneration programme to enhance infrastructure and service delivery. Uhuru’s Government will also assist the administration to improve infrastructure in the County. Speaking yesterday, Joho thanked Uhuru for extending the helping hand to him saying it will help him leave a good legacy at the end of his second term in office. “I partnered with the Government so that I can also implement some projects for my legacy in the town for future generations,” said Joho. Congrats gentlemen with golden handshakes. Very good for our beloved country.